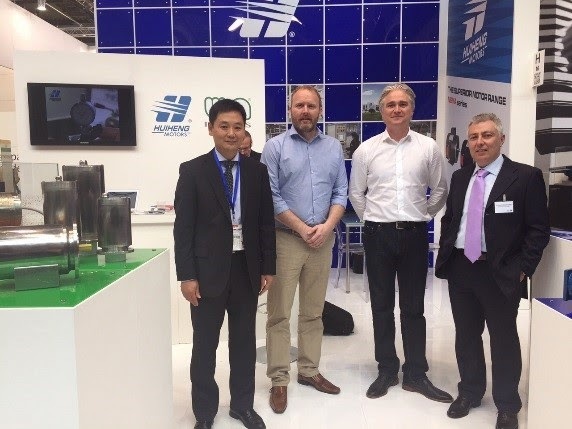 Representatives from Gibbons Engineering Group took a trip to Germany this week to attend Hannover Messe 2015 – the world’s largest industrial fair – and get a taste of the latest innovations in process and automation technology. Hannover Messe is a prestigious five-day event that allows exhibitors across core sectors to showcase innovative new products. Gibbons’ Engineering Services Manager Matthew Gibbons and Sales Manager Paul Scott were there to keep abreast of the latest technology and cutting-edge solutions in industrial automation and energy reduction. The Bonfiglioli stand featured a particular highlight – the Rotor Dynamic Wall, a huge rotating wheel with grips which presented a unique climbing challenge. Matthew and Paul enjoyed speaking with the representatives of Bonfiglioli as we have recently been confirmed as an official UK partner of the company, meaning we’re approved to supply their products including power transmission systems. There was also plenty to see at the ABB display, including their new all-compatible ACS580 variable-speed drive. As an Authorized Value Provider, Gibbons is part of a select network of suppliers for ABB drives so we’re able to deliver the ACS580 direct from stock. Hannover Messe is held annually on the Hanover fairground, hosting around 6,500 exhibitors and welcoming 250,000 visitors each year.